COMET 300634 (C), Salsbury 704055 Drive belt. Kevlar reinforced drive belt for use with 1-3/16” Belt Width torque converter systems 39.12" Inch Length OC. Symmetric Cogged belt for Golf Carts, Rail Car Rebuild Kits, Mini Bajs Karts, and UTV’s. Obsolete Comet Industries Belt 300671 (C/DF). Yamaha 10989 Golf Cart Drive belt. QDS137 Drive Belt for 770/780/790. Obsolete Gates 6000 Sportline snowmobile belt. Genuine Comet Industries 300634 made in USA. 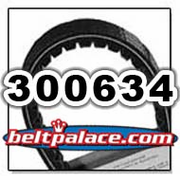 COMET 300637-C, Salsbury 704060 belt, Manco 9875-DF belt.